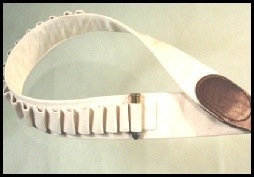 Shotgun Belt - The standard belt, as shown, includes 20 loops for the gauge you use. (As noted above, on smaller sizes we get as many of the twenty loops as possible onto the belt.) We generally stock 12 and 20 gauge belts; other gauges are made to order. Specify your size and gauge. 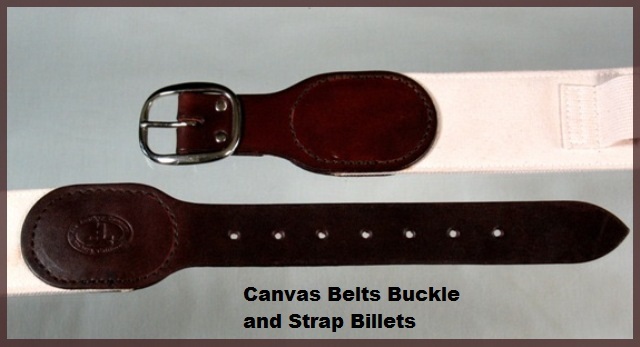 Our canvas belts are 2-1/2” wide with leather billets. 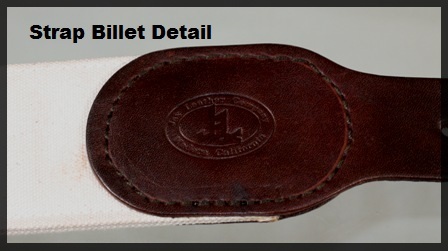 The buckle is a 1-1/2” center-bar nickel over brass buckle for long term durability (in lieu of a nickel plated buckle). We use a cotton webbing for the loops which has proven to maintain its size through many years of use. The standard billet color is dark brown. Please note that the number of loops that can be included on belts under size 34 will vary depending on size, gauge and caliber. For sizing, measurement and other notes, see Additional Information at the bottom of this page. 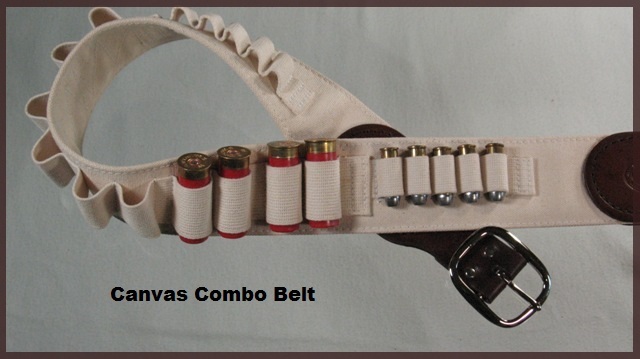 Combo Belt - This is a combination shotgun and cartridge belt. 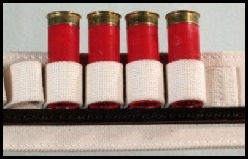 It includes ten (10) shotgun loops set in pairs with 1/2” spacing between each pair and ten cartridge loop (five on each end.) Specify belt size, shotgun gauge and cartridge caliber. 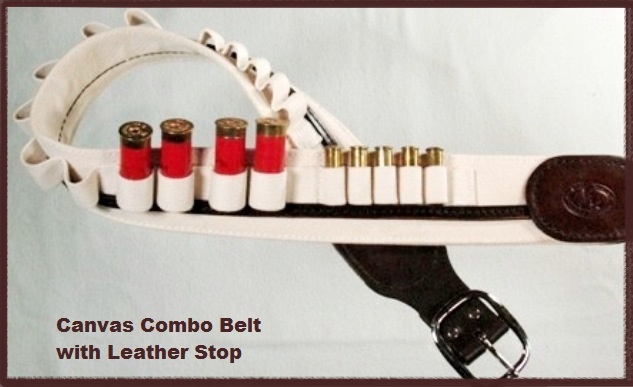 Combo Belt: $75.00 Mixed caliber; add $5. Shotgun and Combo Belts with Leather Stop. Some shooters prefer to have their shotgun shells sit high. 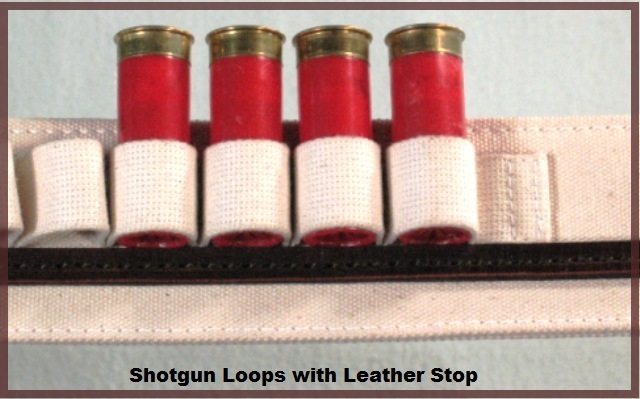 The leather stop accomplishes this although, it’s important to note that the webbing we use for our loops on the regular shotgun and combo belts allows you to set the shotgun shells high at the stage. The loop pattern is otherwise the same as the belts without stops. 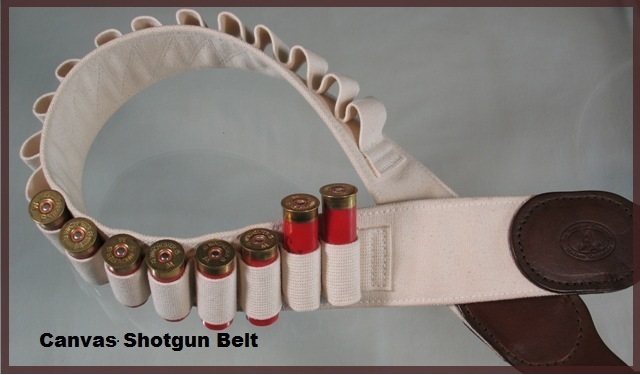 Specify belt size, and applicable shotgun gauge and cartridge caliber. Shotgun belt with leather stop: $75. 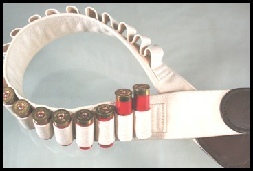 Cartridge Belt - We make cartridge belts for a variety of cartridges. The belt pictured here has the standard twenty (20) loops for 45-70. We usually have some 4570 belts in stock; other sizes are made to order. When ordering please specify your belt size and the caliber(s) you require. If we don’t have a pattern already made for your particular cartridge we may request that you send us three brass cartridges so we can make a pattern from them. 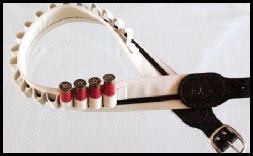 Cartridge belt with 20 loops: $65. Additional loops $1 each. Mixed calibers, add $5 for each additional caliber. Custom Canvas Belts - Jax Leather Company has the ability to customize belts to meet your needs so please feel free to call us to work out the details for your canvas belt. 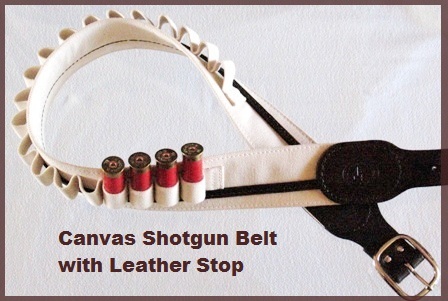 A few examples are combo belts with single vs paired loops; loops set in groups of four for ‘97 shotguns; leather loops on canvas belt; canvas belt with leather stop and double loop for two shotgun shells; etc. If we can understand what you need we can probably make it! Sizes: Our strap billets have seven holes and we like to fit you to the middle hole so there is flexibility of +3/-3 to vary with your garb of the season. If you’re planning on loosing weight then you might want to order your belt at ‘+2 / -4’ or other suitable combination. We typically make belts in even sizes ranging from 24” to 50” on the middle hole. We do make smaller and larger sizes upon request. Measuring for your belt: We strongly recommend that you take your belt measurement over your typical Cowboy Shooting attire, including suspenders. And be sure to measure the size in the location where you’ll be wearing the belt. The belts are typically worn kind of snug. If you’re ordering a canvas gun belt then we encourage you to take the measurement using a long belt with holsters on it because the holsters do take up space. And please be sure to take the measurement where you want to wear the gun belt (high on the waist, low on the hips, slung down on a hip, or wherever, to help assure we’ll be making the right size for your use. A bit of history: JAX has been making canvas belts for well over 15 years, probably closer to 20 years. Our belts wear well. 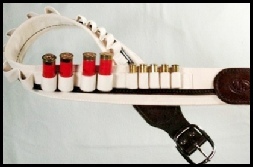 We’ve had the opportunity to make many variations on our standard shotgun and combo belts. We’ve added loops; varied the calibers; dyed the billets to match the gun belts and holsters; varied the buckles including using solid brass to match a gun rig; done leather loops; used Chicago screws in lieu of rivets so customers could change the buckle; and more. We do stick to the 1-1/2” buckle size because our clicker die is set up for that size and we strive to maintain an affordable price for a quality product. That is not to say that we can’t make another style but the price will include the additional design and construction work. It has been our experience and that of our customers that the canvas belt is lighter than a leather gun belt, a real plus in warmer climates. Also we have customers switching from leather shotgun belts because the shells pull easier from the webbing which improves their shooting speed while still affording the holding power of the loop. And speaking of lighter weight, if you’re having problems with the weight of your gun rig affecting your lower back or you have problems keeping the gun rig up on your hips you might want to consider having us make gun belt suspenders for you. They distribute some of the weight to your shoulders and have helped ease problems for our customers and for some, eliminated the embarrassing problem of having a gun rig slip down to their knees! !